Three Rooms Press, 9781941110492, 288pp. 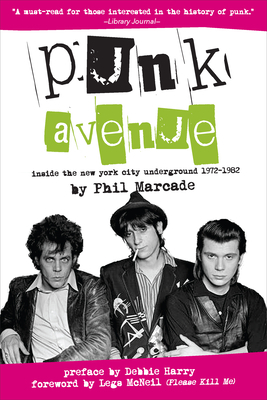 Punk Avenue: The New York City Underground 1972-1982 is an intimate look at author Paris-born Phil Marcade's first ten years in the United States where drifted from Boston to the West Coast and back, before winding up in New York City and becoming immersed in the early punk rock scene. From backrooms of Max's and CBGB's to the Tropicana Hotel in Los Angeles and back, Punk Avenue is a tour de force of stories from someone at the heart of the era. With brilliant, often hilarious prose, Marcade relays first-hand tales about spending a Provincetown summer with photographer Nan Goldin and actor-writer Cookie Mueller, having the Ramones play their very first gig at his party, working with Blondie's Debbie Harry on French lyrics for her songs, enjoying Thanksgiving with Johnny Thunders' mother, and starting the beloved NYC punk-blues band The Senders. Along the way, he smokes a joint with Bob Marley, falls down a mountain, gets attacked by Nancy Spungen's junkie cat, become a junkie himself, adopts a dog who eats his pot, opens for The Clash at Bond's Casino, opens a store named Rebop on Seventh Avenue, throws up in some girl's mouth, talks about vacuum cleaners with Sid Vicious, lives thru the Blackout of 1977, gets glue in his eye, gets mugged at knife point, plays drums with Johnny Thunders' band Gang War, sets some guy's attache-case on fire, listens to pre-famous Madonna singing in the rehearsal studio next to his, gets mugged at gun point, O.D.s on heroin, gets saved by a gentle giant named Bill, lives at night... Never sleeps... A very funny book.